On Friday, 26 June 2015, Minister Falah Mustafa and his accompanying delegation were received by Austrian Foreign Minister Sebastian Kurz. During the meeting, which was attended by the KRG Representative to Austria, Dr Mustafa Ramazan, both sides discussed the latest military developments in the fight against the terrorist militia IS and the difficulties the Kurdistan Region is facing in caring for 1.8 million IDPs and refugees. 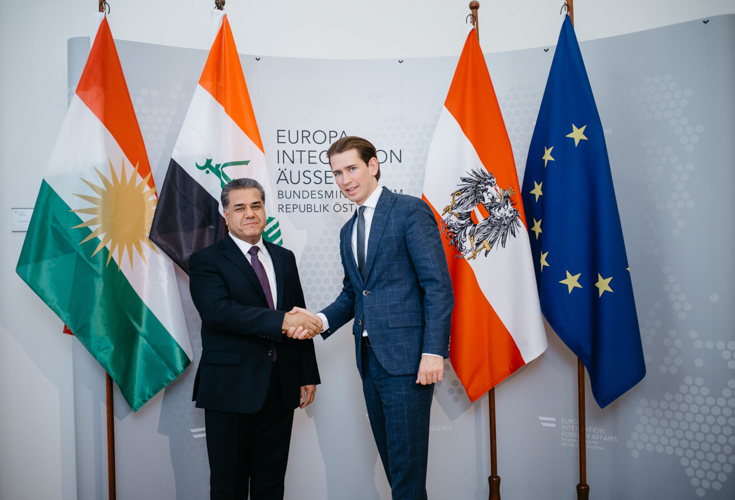 Following his visit to the Kurdistan Region in February of this year, Minister Kurz reiterated the Austrian government’s commitment to continue to provide humanitarian assistance to refugees and displaced persons in the Region. The Minister further praised the role of the Peshmerga forces in the fight against IS, and expressed the readiness of his government to offer medical treatment to wounded Peshmerga fighters. Both ministers expressed their satisfaction at the development of their bilateral relations and discussed ways to further strengthen these ties in various fields. The two sides agreed that the opening of an Austrian honorary consulate would further improve cultural, political and economic relations between Austria and the Kurdistan Region. The meeting was followed by a joint press conference where both ministers responded to questions from reporters. During his official visit to Austria, Minister Mustafa also met with the Chair of Foreign Affairs Committee at the Austrian Parliament, Josef Cap. They exchanged views on the latest military, humanitarian as well as political developments in Kurdistan and the wider Region. Minister Mustafa also met with the Vice President of the Austrian Chamber of Commerce, along with the Chamber’s regional manager for Africa and the Middle East, the Austrian commercial counsellor covering Iraq, and representatives of Austrian companies. They agreed to enhance economic and commercial ties between Austrian and the Kurdistan Region, and the Austrian companies present stressed their interest in taking up or renewing projects in the Kurdistan Region. A discussion with members of Austrian think tanks that focused primarily on the fight against IS and the lessons learned, as well as challenges still to overcome, concluded the official visit of Minister Falah Mustafa to Austria.